One is an elite Episcopal Academy athlete eager to hone her competitive edge. One is an energetic 32-year-old with a desk job looking to prevent chronic low-back pain from threatening his “weekend warrior” ritual. One is a professional lacrosse player hungry to boost his on-field performance. And one is a former pro basketball player hoping to play golf without pain. Although all of these individuals have completely unique goals, as well as completely unique bodies, each of them finds relief in the care of Dr. David W. Nadler and Associates P.C. “I’ve always been very passionate about health care and sports medicine, but I also thought there was a void between surgery and more conservative therapies,” says Dr. Nadler, who received his doctorate from Pennsylvania College of Chiropractic in Philadelphia. “I felt that chiropractic and sports medicine filled that void. Only a certain percentage of people out there with acute or chronic pain are candidates for surgery; most back pain and other musculoskeletal pain is mechanical. When you can treat those conditions in a minimally invasive way, using multiple therapies that complement each other, the result is usually very efficacious. One of the most revolutionary modalities is known as Radial Shockwave Therapy. This handheld device transmits high-energy acoustic waves through the surface of the skin and into areas of the body affected by chronic pain. The acoustic waves break up scar tissue and calcific deposits in the treated area, and the body’s natural healing response surrounds the area with healthier, “neo-vascularized” tissue. Initially used to treat kidney stones, Radial Shockwave Therapy has since been used to address a host of musculoskeletal conditions, as well as help people affected by cerebral palsy and those recovering from burns. Dr. Nadler suggests it can even be used for certain kinds of facial regeneration. Dr. Nadler typically recommends a five-treatment protocol to experience the therapy’s full benefits. Although the therapy does cause some mild discomfort, most patients experience a significant reduction in pain, if not complete relief. For patients looking to enhance muscle tone, flexibility and balance, Dr. Nadler often prescribes Whole-Body Linear Gravity Plate Therapy. Delivered by way of powerful motors beneath a vibration platform, the therapy combines intense full-body vibrations with repetitive movement to work isolated muscles (or muscle groups) and stimulate mechanoreceptors. Dr. Nadler most often uses this form of therapy to assist athletes seeking to improve their on-field performance. Although Dr. Nadler uses this form of therapy primarily as a tool for sports rehabilitation and conditioning, he says it offers significant benefits for older patients looking to improve their balance and counter the effects of aging. Other revolutionary noninvasive, nonsurgical treatment options include the Graston Technique and vertebral axial decompression, or VAX-D. The Graston Technique utilizes stainless-steel instruments to treat chronic, acute and postsurgical soft-tissue conditions. The instruments, which are shaped to treat different parts of the body, effectively break down scar tissue and relieve the inflammation that can contribute to conditions such as chronic tendonitis and fasciitis. VAX-D, meanwhile, utilizes a specialized table to “open up” the intervertebral disk spaces as a way to address a number of therapy-resistant syndromes of the lower back. Dr. Nadler truly designed his practice to serve the “whole patient.” Besides working to alleviate patients’ musculoskeletal inflammation, Dr. Nadler aims to reduce his patients’ full-body inflammation through the restorative powers of nutrition. “We are all systemically inflamed, whether it’s heart disease, musculoskeletal issues or even multiple sclerosis,” he says. “The foods we eat and the replacement of fluids make a big difference, not only from an athletic perspective but for one’s general health and well-being. From daily nutrition to sports nutrition to vitamins and supplements like fish oil, magnesium and COQ10, I like to advise a very effective, anti-inflammatory protocol, with a supplemental regime based on each patient’s needs. Dr. Nadler is a certified chiropractic sports physician through the American Board of Chiropractic Sports Physicians and is board certified through the National Board of Chiropractic Examiners. Also, he has been granted diplomate status through the American Academy of Pain Management. 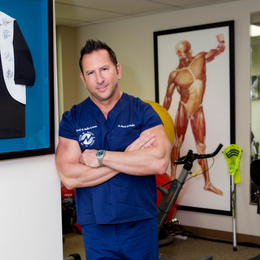 Throughout his career, he has served as chiropractic physician for professional sports teams, including National Lacrosse League’s Philadelphia Wings, Major League Lacrosse’s Philadelphia Barrage, Major Indoor Soccer League’s Philadelphia Kixx and Arena Football’s Philadelphia Soul. As of last year, he became the official chiropractic care physician for the Philadelphia Freedoms of World TeamTennis, founded by tennis legend Billie Jean King. In addition, he has treated elite competitors in national and international events, such as the X-Games, the FIFA Women’s World Cup, and the Men’s U.S. National Gold Cup soccer team. Dr. David W. Nadler and Associates P.C.